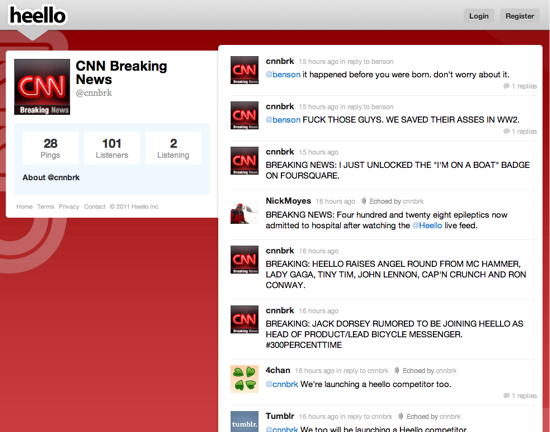 It’s easy to write off Heello as a Twitter clone. Created by the founder of Twitpic, the shameless knockoff looks and behaves like a stripped-down version of Twitter, down to the tweets pings, followers listeners, and retweets echos. But it’s shaping up to be more than that. Creative fakesters are using the blank slate to turn Heello into the parallel-universe version of Twitter. 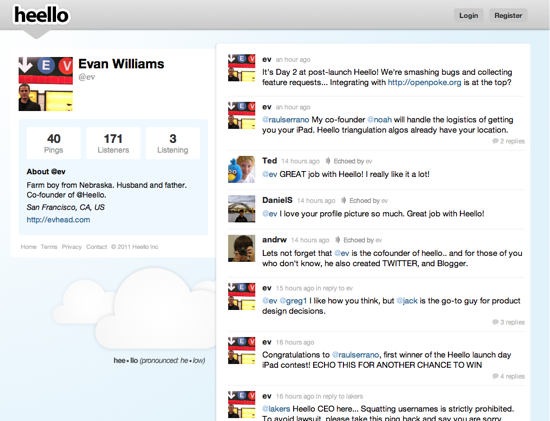 A world in which Heello was cofounded by Ev Williams (@ev), who acts as CEO and gives away free iPads to Heello users. A world where Mark Zuckerberg (@MarkZuckerberg) is a profane, sexist womanizer. 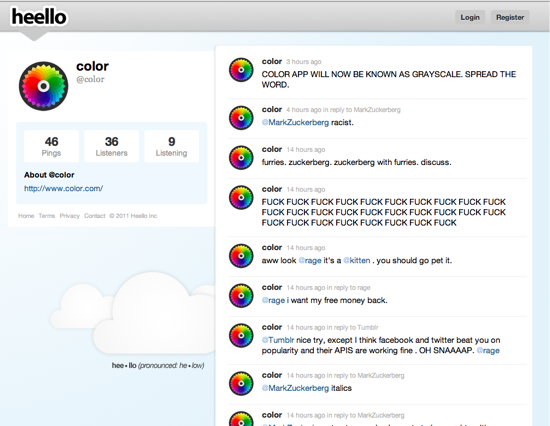 And where major web services (past and present) flirt and snark at each other, like @Tumblr, @Color, @4chan, and @Pownce. Heello is like a blank-slate Twitter with no moderation or verification. I doubt the Heello team wanted or expected this behavior, but they inadvertently created a perfect playground for parody and meta-commentary, like Uncyclopedia or Encyclopedia Dramatica‘s parallel world versions of Wikipedia. It should be fun to see how they respond. Update: Marshall Kirkpatrick, lead writer of ReadWriteWeb, comments, “They told me they were going to remove any of these that weren’t clearly satires. That’s a real shame and shows a lack of sense of humor.” The first casualty was @ev, which was deleted shortly after this post was published. Shame. The @ev page has already been removed. Now, I wonder whose insistence that was? but instead of parody vs reality its the Earth Tone Collation vs The Forces of Brightness – taking a service and in this case a game – way off it’s intended course. I guess I’m wondering why Helloo exists…. like, really…. 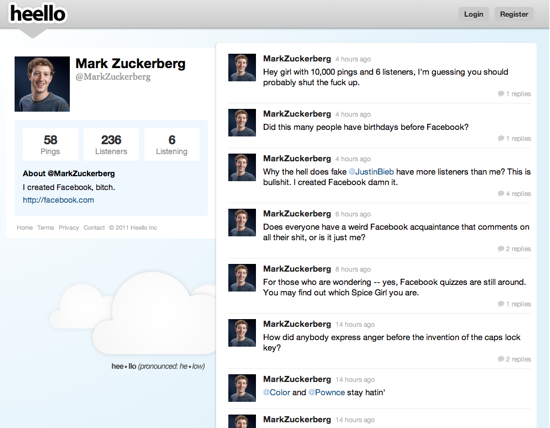 just an experiment/blank slate twitter that the creators tried out but won’t go anywhere with? Hopefully, they’ll only pull the accounts that claim to be representing Heello. Cause otherwise why would I go there? Nice choices for your post. I guess the next phase will be people creating sites to track these accounts! They told me they were going to remove any of these that weren’t clearly satires. That’s a real shame and shows a lack of sense of humor. That’s a real shame; they’re killing the only compelling reason I had to visit Heello. If it’s just a Twitter clone, why should I bother? Bet you Luke McKinney does an article on Zug about this. 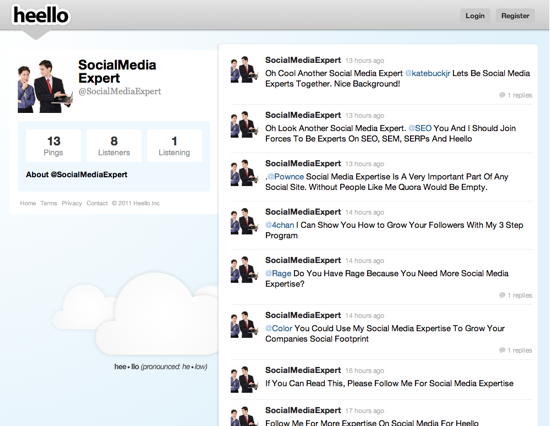 That @SocialMediaExpert account made me laugh until I cried. My girlfriend (who doesn’t even Twitter) asked what was so funny. It turned out to be very difficult to explain to her. I find heello refreshing compared to Twitter. Maybe it’s the lack of newsfeeds and automated junk – I have a feeling people are going to use this thing! Ev Williams (@ev) was removed from heello following your story! So far as I can figure, this is the only way to delete your useless heello profile.